EYE ON THE PRIZE: The clock is ticking and we should be focused on the 2018 election! Where is the leadership on taking back Congress in 2018? That is our best way of fixing the mess the nation is currently in. If the Democrats had both Houses then there could be unhampered investigations of this Russian nonsense and Trump's conflicts of interest. Plus, if we had the House of Representatives, then the Democratic Speaker of the House would take over when Trump and Pence were forced out. We should be organizing now! Does anyone think there is a national sense of urgency in the Democratic Party? Who should be leading the charge? He must have signed a non-disclosure agreement with the Trump clowns. Remember when Trump said he would not take a salary as President? Do you think that he is working for free now? University of Pennsylvania President Amy Gutmann today announced that Vice President Joseph R. Biden, Jr. has been named the Benjamin Franklin Presidential Practice Professor at the University of Pennsylvania, where he will lead the Penn Biden Center for Diplomacy and Global Engagement, a new center focused principally on diplomacy, foreign policy, and national security. The Center will be located in Washington, D.C. Biden will also have an office on the Penn campus in Philadelphia. The Penn Biden Center promises significant impact for both Penn’s teaching and research missions. As Presidential Practice Professor, Biden will hold joint appointments in the Annenberg School for Communication and the School of Arts and Sciences, with a secondary affiliation in the Wharton School. “At Penn, I look forward to building on the work that has been a central pillar of my career in public office: promoting and protecting the post-WWII international order that keeps the United States safe and strong,” said Vice President Biden. “The Penn Biden Center and I will be engaging with Penn’s wonderful students while partnering with its eminent faculty and global centers to convene world leaders, develop and advance smart policy, and impact the national debate about how America can continue to lead in the 21st Century." One of the youngest people ever elected to the U.S. Senate, Biden served as a Senator from Delaware for 36 years, establishing himself as a leader on many of the nation’s most important global and domestic challenges. Over the course of his more than four decades of public service, he has represented the U.S. in every region of the world. As Chairman or Ranking Member of the Senate Foreign Relations Committee for 12 years, Biden played a pivotal role in shaping U.S. foreign policy. He was at the forefront of issues and legislation related to terrorism, weapons of mass destruction, post-Cold War Europe, the Middle East, and Southwest Asia. He also left a lasting mark on domestic policy as a Senator; as Chairman or Ranking Member of the Senate Judiciary Committee for 17 years, Biden was widely recognized for his work on criminal justice issues, including the landmark 1994 Crime Law and the Violence Against Women Act. As the nation’s 47th Vice President, Biden continued his leadership on important issues facing the nation. A close advisor to President Barack Obama on international affairs, Vice President Biden has represented our country in every region of the world, developed deep relationships with numerous world leaders, and demonstrating U.S. commitment through high-level, face-to-face diplomacy. He was the Obama Administration’s point person for diplomacy within the Western Hemisphere, working to realize his vision of a Hemisphere that is “middle class, secure, and democratic, from Canada to Chile and everywhere in between.” The Vice President also led the Administration’s efforts to support a sovereign, democratic Ukraine, visiting the country three times in 2014. He was deeply involved in the Middle East, particularly by shaping U.S. policy toward Iraq. On the domestic front, Vice President Biden was tasked with implementing and overseeing the $840 billion stimulus package in the American Recovery and Reinvestment Act. He also led the Ready to Work Initiative, the Administration’s key effort to identify opportunities to improve the nation’s workforce skills and training systems. A long-time advocate against sexual assault and domestic violence, the Vice President appointed the first-ever White House Advisor on Violence Against Women. In his final State of the Union address in January 2016, President Obama tasked Vice President Biden with leading the nation’s Cancer Moonshot program to “end cancer as we know it,” an effort that the Vice President formally launched several days later when he visited Penn’s Abramson Cancer Center. On January 12, 2017, President Obama awarded Biden the Presidential Medal of Freedom, with Distinction, the highest civilian honor in the U.S.
Biden and his family have a long affiliation with Penn. His late son Beau, daughter Ashley, and granddaughter Naomi are all Penn graduates. In May of 2013, Biden received an honorary degree from Penn and was the University’s commencement speaker. As both U.S. Senator from Delaware and Vice President of the United States, Biden has spoken numerous times at Penn and has been a regular visitor to campus. As a significant component of Gutmann’s Penn Compact 2020, Penn has made a major commitment to extend the University’s global engagement by bringing the world to Penn and Penn to the world through broad-ranging University-wide programs, including the opening of the Penn Wharton China Center in 2015 and Perry World House in 2016. Penn Global was established in 2012, with the goals of preparing students for a globalized world, strengthening Penn as a global agenda setter, and deploying Penn research to promote healthy, inspiring and productive lives. It works with faculty and schools across the University to bring new research, ideas and perspectives to global education around the world. Perry World House, Penn’s new global research hub dedicated to advancing interdisciplinary, policy relevant approaches to the world’s most urgent global affairs challenges, will play a critical role integrating the work of the Penn Biden Center with Penn’s broader academic and policy communities. The Penn Biden Center for Diplomacy and Global Engagement will open its Washington, D.C. office later in 2017. A second coup in the White House? Respectfully but firmly, the retired general and longtime Marine told Bannon that despite his high position in the White House and close relationship with Trump, the former Breitbart chief was not in Kelly’s chain of command, two administration officials said. If the president wanted Kelly to back off from issuing the waiver, Kelly would have to hear it from the president directly, he told Bannon. We need a National Resistance Coalition, NOW! Is anyone working on something like this? Right now, there are too many organizations vying for our resistance dollars. It is hard for me to decide where to put my dollars and energy. To move forward successfully, we need a national conference to bring the major groups together and to begin mapping a strategy that will regain control of our country from the fascists who are seizing control of all elements of our government and social fabric. Groups should organize to reclaim our Congressional and Senate seats, state legislatures, governorships, etc. We only have 3 years before the redistricting of Congressional districts takes place in the state legislatures following the 2020 US census!! To involve the people in the non-coastal areas (Red States?) and as a sign of unity, I propose such a meeting take place near the Mean center of the United States population. St. Louis, MO may be the closest city with a large airport. To resist the current coup in our government that aims to remove the past 80 years of political and social progress, we need a concerted and organized effort to get the job done. I propose a four-day meeting starting on June 30 and ending on July 4. Meetings should be held throughout the day with 30-60 minute prime-time presentations by nationally respected orators to be televised or broadcast on the internet. The last day should end with a longer program with a statement of principles and a plan for action. There should be lots of patriotic fervor throughout the meeting, reflecting on our history/struggles and extolling the greatness of our people. And lots of music and fireworks on the last day to unify us! I think that the Senate should use the same standard they used for Merrick Garland's nomination and apply it to Trump. Trump has less than a year left in office (no, really!!) as did Obama so the Senate should ignore whomever wins the pageant tonight and wait until a new President comes along. I do not think I have seen this shared here. Came across this poem by WH Auden set to music with images. The poem was written in 1939. Wikipedia notes: "The poem dramatizes the condition of Jewish refugees from Nazi Germany in the years before World War II, especially the indifference and antagonism they faced when seeking asylum in the democracies of the period." Yet there's no place for us, my dear, yet there's no place for us. Old passports can't do that, my dear, old passports can't do that. But where shall we go to-day, my dear, but where shall we go to-day? O we were in his mind, my dear, O we were in his mind. But they weren't German Jews, my dear, but they weren't German Jews. They weren't the human race, my dear, they weren't the human race. I just looked up the quote below and came across a great book cover illustration that reminded me of Trump (at bottom of this message). Now I will need to go and re-read Animal Farm by George Orwell again because I think Trump reminds me of Our Leader, Comrade Napoleon, Father of All Animals, Terror of Mankind, Protector of the Sheep-fold, Ducklings' Friend. He is described as "a large, rather fierce-looking Berkshire boar" who is "not much of a talker" and has "a reputation for getting his own way". 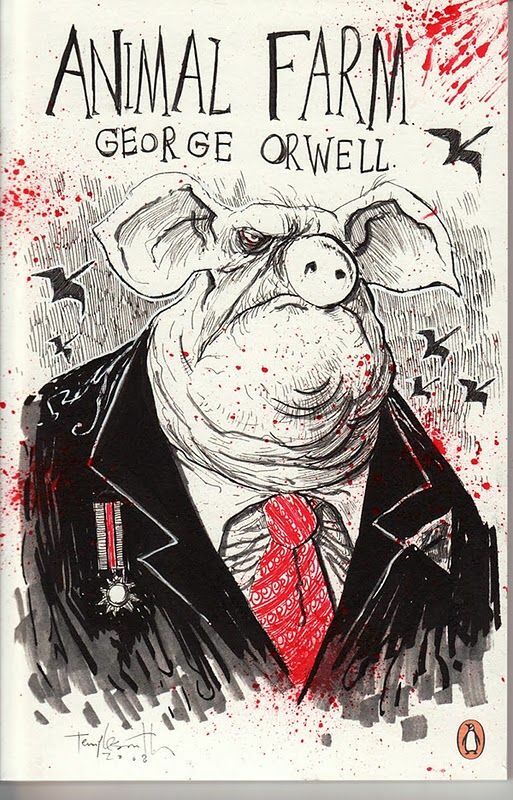 While he is at first a common farm pig, he gets rid of Snowball, another pig, who is his rival for power, and then takes advantage of the animals' uprising against their masters to eventually become the tyrannical "President" of Animal Farm, which he turns into a dictatorship. Remember "All animals are equal, but some animals are more equal than others". I would love to see a caricaturist portray Trump as a pig on the cover of Animal Farm. Must include double chins and extra long tie. I am watching the National Prayer Service and note that Trump never bows his head nor does he close his eyes during a prayer. When a response is called for, he does not read the congregational response that is printed in the service program. He did not sing much suring the service. Very disrespectful and inappropriate for someone who claims to be such a avowed Christian!